It may look like a smiling mecha puppy of vast proportions, but this suburb-eating robot is a vicious destroyer of suburbs and suburbanites whose giant legs pulverize housing tracts in order to plant new forests. 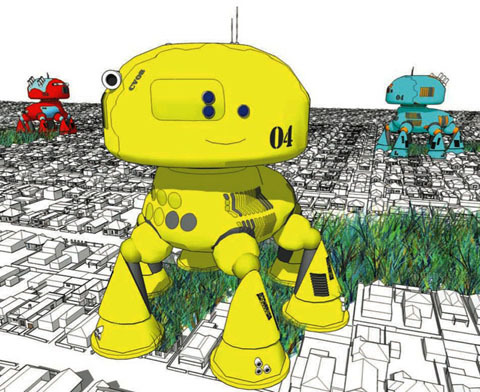 The creation of Australian firm Andrew Maynard Architects, the suburb-eating robots will be deployed to clean up abandoned, decaying suburbs in Australia when peak oil forces people to stop driving cars and move into the urban centers. These mega-bots are going into production in 2019, and their engines will be fueled entirely by human fat. The age of the outer-suburb is soon to come to an end. Many analysts believe that Peak-Oil will be reached soon after 2011. When we hit Peak-Oil we will not only have no petrol to run cars, furthermore we will no longer have many of the goods we need and there will be huge food shortages as food production and distribution relies heavily on oil based fertilisers which drastically increase yields. With no cars people will no longer be able to reach the suburbs and hence metropolitan populations will swell as suburban refugees are forced to wander into the cities . . . The suburbs will decay . . . At Andrew Maynard Architects, we have decided to give mother-nature a hand. We have begun designing the first suburb eating robot and we hope to go into production in early 2019. We have called our robot the CV08. In short, CV08 consumes the abandoned suburbs through its front 2 legs. It processes the materials and fires off compacted recycling missiles to awaiting recycling plants. CV08's middle legs and one rear leg follow the front legs to terra-form the newly revealed earth with native Flora and Fauna. Vast stocks of the Flora and Fauna are stored within CV08 in carbonite sleep until they are required to colonise what was previously suburban wasteland. Over 50% of Australians are currently over-weight due to complete car dependence, a sedentary lifestyle and over eating. With this in mind the 6th leg has been designed to pick up, and apply liposuction to over-weight Australians that have been to slow and unfit to migrate into the denser areas with the rest of the population. As there is no longer a steady stream of oil, CV08 fuels itself with the vast quantities of excess human fat that it finds on its journey through the suburbs. And here I thought the only thing that fat was good for was making alien babies on Doctor Who.